The Linn Cove Viaduct is a 1,243-foot curved bridge that carries the Blue Ridge Parkway around one of the most environmentally sensitive areas of Grandfather Mountain in Avery County. The viaduct opened to traffic on 11 Sept. 1987, exactly 52 years after construction of the parkway began. 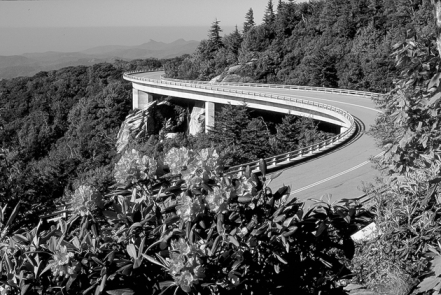 Completion of the 469-mile scenic highway was delayed for many years while the National Park Service and Grandfather Mountain, Inc., considered various routes around the eastern slopes of the mountain. The design of the viaduct provided the long-awaited solution to traversing the Linn Cove boulder field, the most problematic area from an environmental standpoint to be crossed by the parkway. Construction of the viaduct redefined expectations for modern bridge-building design by proving that structures could be utilitarian in function and still preserve the environment. The viaduct was designed by Figg and Mueller Engineers, Inc., of Tallahassee, Fla., and the general contractor on the project, whose cost totaled $10 million, was Jasper Construction, Inc., of Plymouth, Minn. The S-curve roadbed rests on seven vertical piers spaced 180 feet apart and consists of 153 precast concrete segments cemented together with epoxy glue and held in place by tension cables that run through the center of the span. Each of the 100,000-pound segments is a different shape, and only segment No. 93 is square and straight. The road served as the building platform from which workers erected the bridge one segment at a time, moving their equipment out along the span to begin the next section. This method eliminated any need to scar the landscape with access roads or to compact fragile soils with heavy machinery. The Linn Cove Viaduct has received more than a dozen national design awards, including a Presidential Design Award in 1984 and the American Consulting Engineers Council Award for Engineering Excellence in 1985. Its distinctive S-shape is recognizable in numerous national automobile TV commercials. In response to the public's interest in the viaduct, the National Park Service has built a visitors center nearby with interpretive exhibits as well as a system of trails that winds under and around the bridge. "Viaduct Designer Revisits Landmark," Avery Journal, 16 Sept. 1993.